Rep. John Conyers’ reelection campaign got a boost Friday when U.S. Circuit Judge Matthew Leitman ordered Michigan officials to put his name back on the ballot, the Washington Post reports. Conyers was first elected to office 1964. The order came just hours after state election officials upheld an earlier decision to remove Conyers’ name from the ballot after he failed to obtain enough valid petition signatures, the Post reports. His candidacy was jeopardized after it was determined that people collecting signatures were not registered voters, a violation of law. But lawyers representing Conyers pushed back, questioning the constitutionality of the law, the Post says. Leitman, who did not address the constitutional issue, said he ruled for Conyers because the plaintiffs challenging the law “have shown a substantial likelihood of success” and “because time is of the essence,” the Post reports. The decision came on the day that the Michigan secretary of state’s office upheld Wayne County Clerk Cathy Garrett’s May 13 decision to remove Conyers from the ballot, the report says. The clerk and the secretary of state argued that scores of signatures collected by Conyers’ campaign to get his name on the Aug. 5 primary ballot were invalid because they were collected by people who were not registered voters. The challenge was pushed by Conyers’ primary opponent, the Rev. Horace Sheffield. "We all look forward to Congressman Conyers being victorious in August and again in November,” Conyers attorney John Pirich told the Post during a brief interview Friday. This week, The Root’s Corey Dade hit Conyers hard, saying he should have had the election process “down pat” after 25 times. 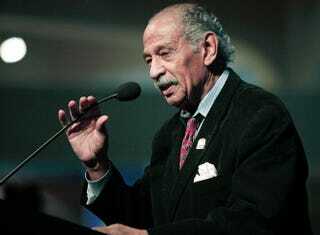 “But this is John Conyers, whose tall legislative achievements and enduring ideological vigor at 85 years of age are matched by his wont for aloof and lazy handling of administrative details, not to mention an embarrassing knack for ethical and personal troubles,” Dade writes.